What is Trunk or Treating? A fun way to Trick or Treat in the school parking lot with friends. Children should arrive in costume and go from car to car “Trunk or Treating”. Parents may dress up also, and will hand out candy at their own car trunk. 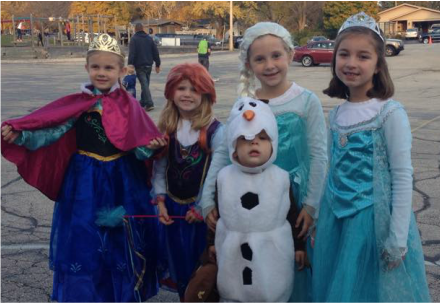 The parking lot opens at 5pm and will close at 6pm for Trunk or Treating. For the safety of the children, no one will be allowed to enter or leave the lot between 6:00 - 6:45pm. Parking lot attendants will be on hand to direct you to a parking space. When does Trunk or Treating start? At 6pm, a whistle will sound signaling the start of Trunk or Treating. For the safety of all children, parents MUST supervise and keep their child at their car until 6pm. How much candy should I bring? We are expecting 250-300 children. Children will only be allowed to complete the circle one time. Do I have to decorate my car? No, but it is encouraged. Think of your trunk as your front porch. You can decorate it as much (or as little) as you please. Are there any guidelines about the type of trunk décor and costumes? We are asking all participants to remember that this is a family fellowship event with many, very young children attending. Please avoid devils, monsters, etc. or anything gory or too frightening. Where do I pick up my pre-order Cousins Sub Meal? Pick up pre-order food at the outdoor concession stand between 5:15-5:45pm. Can I purchase food on the night of the event? No, the only food available will be pre-order Cousin Subs meals. Order forms are on the school website and are due Oct. 16th. Limited beverages will be available for purchase. Why isn’t the indoor Fall Festival portion with the games and jail/bail happening this year? Unfortunately, the number of volunteers willing to pull off this event has dwindled over the past few years and the small committee of parents that remain are unable to pull it off. We’re looking forward to a fun Trunk or Treat event this year and hopefully we can bring back the festival portion of the event in the future. IMPORTANT: The parking lot will re-open at 6:45pm for cars to exit. All cars will need to exit up the hill onto Park Ave. or onto Hayes Ave. PARENTS–it is very important that you closely supervise your children while cars are leaving the lot. It will be dark and crowded.